Welcome to my Website. I hope the information here lets you know a little about what I do. If you have any questions please feel free to contact me. 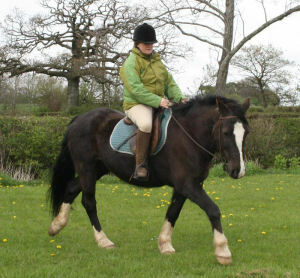 I am a freelance horse trainer and riding instructor working from my own premises in North Cumbria. I use a modern progressive method of horsemanship that centres around allowing a horse to be confident and accepting of his life and work. I start horses under saddle; re-school horses that have got into difficulties in their ridden work or handling and rehabilitate horses that need intensive remodelling of dangerous behaviours. I also offer private or group lessons on your horse. I offer a small range of equipment, which is handmade to a high quality. I hope that you enjoy my website and find the information that you are looking for here. If not please feel free to contact me and I will be happy to answer your question. Really looking forward to hearing from you!